There’s nothing quite like that freedom you feel pedaling new terrain. Wind in your face, sun on your back, and your bike taking you on adventures just down the road. 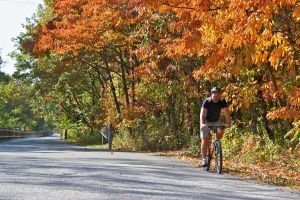 With the abundance of awesome bike trails in Indiana’s Cool North, it’s no wonder so many visitors can’t resist the lure of those pathways that lead to shady forests, mysterious marshlands, friendly towns and Amish enclaves. You’ll find many of the trails are open to a host of other activities, including hiking, walking, in-line skating, and cross-country skiing. Several are also handicap-accessible. 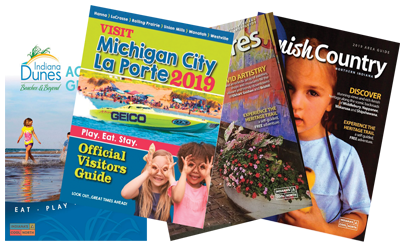 You can also access trails and attractions along the southern shores of Lake Michigan from Chicago to South Bend by using Bikes on Trains. 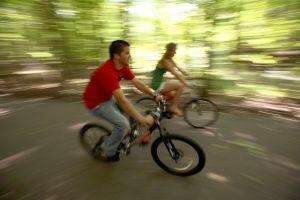 So wheel along with us on some of Northern Indiana’s best bike trails. An up-close portrait of Amish life emerges as you pedal the Pumpkinvine Nature Trail, a relatively easy 17-mile route named for an early 1900s train route. Back then, the passenger and mail service railroad gained the nickname “pumpkin vine” because of its curves and turns, a characteristic that cyclists love today. The trail begins in Goshen and continues through Middlebury and on to Shipshewana, all communities in an area that is home to the nation’s second largest Amish population. Along the way, you’re sure to spot horse-drawn buggies and venerable white Amish farmsteads set in the serene green countryside. The trail also connects with other trails that lead to Elkhart. 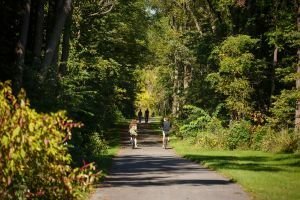 A popular rail-trail corridor, the Mapleheart Trail offers a diverse landscape and connects with other trails. The five-mile asphalt route begins in Elkhart and continues south to the outskirts of Goshen through both city and residential areas. At the trail’s halfway point, you’ll go past Ox Bow County Park, lush with flowers, greenery, and wildlife habitats – a great spot to take a breather and enjoy the playground, hiking trails or a round of disc golf on the park’s challenging 24-hole course. The south end of the Mapleheart Trail connects with the new Wilden Avenue Trail, which continues southward for three miles into downtown Goshen, where it directly connects to the Pumpkinvine Nature Trail (see above). When you travel the Prairie Duneland Trail, it’s easy to see how this route, considered the “crown jewel” of Indiana bike trails, got its name. Both prairies and dunes create a stunning landscape in spots along the trail, just a few miles south of Lake Michigan and the Indiana Dunes National Park. The flat, concrete rail-trail, popular with families, travels a diverse route of more than 10 miles where you see ponds and trees, but also pockets of suburbia as you head west from Chesterton to Hobart. The trail passes through wide-open farm fields and even some remnants of tallgrass prairie. 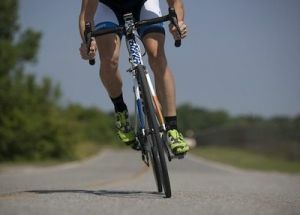 With a lovely woods on one side and a farm field on the other, a new 1.5-mile section of the Lincoln Memorial Trail in Westville makes a great short bike ride or pleasant walk on both paved and unpaved parallel corridors. Starting at Bluhm Park, the trail runs east with surprises along the way, including an old-fashioned windmill and a pond where willows and hardwoods reflect in the water. The trail includes a loop through the woods. Seven miles of mixed hills, gullies, flatlands and even tree obstacles give mountain biking buffs some exciting new action at the Soldiers Memorial Bike Park Trail, the city of LaPorte’s first mountain biking trail. The trail is located in the popular Soldiers Memorial Park, which encompasses Stone Lake and provides a host of recreational activities. The park is known for its forested beauty, a definite plus for the enjoyment of mountain bikers who come to try out this new venue for adventure. If you need a cool-down after zooming through the woods, head for the swimming beach. New to mountain biking? Potato Creek State Park is a cool place to start, with a great 7.7-mile beginner-level trail and an abundance of scenery too. But intermediate riders can get plenty of thrills as well on this track designed for speed with a mix of paved paths, dirt lanes and grassy fields. The trail cuts through thick woods and wetlands in this park, which includes a lake with a beach – a perfect spot to dive in after you ride. Potato Creek also include 3.3 miles of bicycle trail, where you can wind up and down wooded hills and pass through wetlands at a more subdued pace. Here’s a six-mile Northern Indiana trail that’s perfect for all levels of mountain bikers. The Rum Village Pathway, located in the annex to woodsy Rum Village Park provides three interconnected segments – beginner, about a mile long; intermediate with another two miles, and advanced, another three. It gets tougher as you go, but each segment has a return to the beginning if you don’t want to go further. Hills turn steeper and more challenging with every uptick in skill level. Get ready for an adrenaline rush on the advanced stretch with steep climbs, switchbacks and a steep jump at the end.